Life as Pink Einstein | Dallas Fashion and Lifestyle Blogger: Old Navy Dressing Room Try On! Old Navy Dressing Room Try On! I love writing these posts, it gives me an excuse to go shopping! I am back with another dressing room try on so that I can share about a sale going on but don't worry, it's not the Nordstrom sale, I am so tired of hearing about it, the prices aren't even that great. Old Navy has 30%-50% off right now and I found some great items! Here's what I wore to the store. My top is from Lilly Pulitzer, my shorts are from Old Navy, and I'm wearing my Jack Rogers sandals. I have searched their whole website for this dress and can not find it which is so disappointing because it is so cute on! I love the cut with the v neck and the buttons and it has a shift dress shape so its so comfortable. The one thing I hate about writing these posts is sharing the items I didn't buy and regretting not buying them. This is one of those items. This chambray dress is so cute and its so versatile I could wear it all year round. I put it back because I didn't like the length of the dress. I originally picked this dress up so I could wear it in the fall and winter with tights and riding boots but its so long that I don't know that boots would look good with it. If you are taller it might work but I am only 5'4". Everyone has been wearing yellow lately and although it is one of my least favorite colors I thought it was time I hopped on the bandwagon because it looks so cute on! I can't find this dress online either but these dresses are available in multiple colors in stores and they are only $15. Obviously this dress is a little see-through so you do have to wear light colored underwear underneath but that is the only down side to it. The darker striped dresses don't have that issue, just the yellow. I adore this skirt! I don't own very many skirts but I love them so I knew I had to have this one! I love the white buttons, the length of the skirt and of course, the stripes. I feel like this is a piece that can be dressed up or dressed down and I can not wait to experiment with the different ways I can wear this skirt. Once again, I love the yellow! As most of you know I own a plethora of striped clothing items but not a single one of them is yellow so I thought this top would be a great addition to the collection! Isn't this top cute! I almost didn't pick this one up off the rack and I'm so happy I did! The shade of blue used in this top is so pretty and all of my other gingham tops are navy or black. I love the buttons and the over all design of the top! This top is something I think I will be able to wear from spring up through the fall and I'll be able to style it so many different ways. Old Navy is having a 50% off all new arrivals and 30% off clearance items sale right now and let me say, you better hurry, they have some super cute items! All of these items except for the green dress were either on sale or clearance (part of the reason I had a hard time finding the items online) but I would recommend checking your local Old Navy, the stores seem to carry items longer than their online store does. 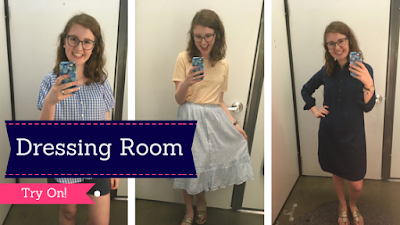 If you would like to read previous Dressing Room Try Ons, you can find them here.